The offers for the cards listed in this post have expired, so the links have been removed. Click here for the top current credit card sign up bonuses. Just a few months ago I wrote a post for newbies called How to Earn 105,000 Miles in the Next Few Weeks. The post was an introduction to miles-earning credit cards through the best deal at the time: opening two personal American Airlines credit cards at the same time and getting 50,000 miles from each. That deal is now doubly dead. 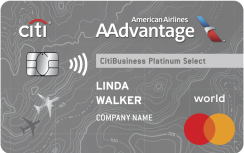 You can no longer be approved for two Citi cards on the same day–not even one personal and one business–and there are no more 50,000 mile offers for Citi AAdvantage cards. The new current best offer is to combine a 40,000 Citi® Platinum Select® / AAdvantage® World MasterCard® with an application for the identical business card the next day. The Citi® Platinum Select® / AAdvantage® World MasterCard® comes with my favorite feature by far of any airline credit card. While you’re a cardholder you’ll get a 10% miles rebate on all your American Airlines award redemptions up to 10,000 miles rebated per calendar year. That means that if you booked a roundtrip business class award to Europe with your American Airlines miles while you were a cardholder, you’d get 10,000 miles back for a total cost of only 90,000 miles roundtrip! If you open both the personal and business card and redeem the 86,000 miles this year, that’s another 8,600 miles rebated because of this benefit. The benefit is automatic, no enrollment necessary. Here’s my experience with the rebate last year. I value the 10,000 extra miles a year at about $170, so this is a huge ongoing benefit to me and one reason that I hold a Citi AA card. This is in addition to a free checked bag when flying American, priority boarding, a discount on in-flight purchases, and double miles on American Airlines purchases. The card has no annual fee the first 12 months, then $95 thereafter. The best business card offer is also 40,000 bonus miles after spending $3k in three months. The main difference with the personal card offer is that the business card offer doesn’t have a landing page where you can verify the benefits, but the benefits are basically the same including no annual fee the first 12 months, then $95 thereafter. Instead the business card offer is being relayed by FlyerTalk members who have applied for the card in the last few weeks and reported the terms of the offer relayed to them by a Citi customer service agent upon activating their new card. If you are comfortable applying for a card with no landing page–I am, I just applied for this card–then the application link is here: Citi Business AAdvantage Card. Citi realized people were getting two personal AA cards at once, and “over-closed” that loophole. You can now no longer get two Citi cards the same day, not even one personal and one business card. To get a personal and business AA card, apply for the personal card today and the business card tomorrow. Make sure the applications are at least 24 hours apart, maybe 36 hours to be safe. What Can You Do with 86,000 American Airlines Miles? 1) 80,000 miles are enough for a roundtrip from the US to Europe with one direction in business class. If you haven’t flown business class, you have several options with fully flat beds. I wrote about American’s Los Angeles to London route featuring flat beds in business class here. 2) 60,000 miles is enough for a roundtrip from the US to Northern South America in business class. That means you can fly to Peru both directions in fully flat beds on the newest commercial airplane (787 Dreamliner) on American Airlines-partner LAN Airlines. I talked more about this here. 3) 67,500 miles is enough to fly oneway from the US to anywhere in Asia in First Class on Cathay Pacific, which is considered by many to be the best first class experience in the world. 4) 90,000 miles is enough for a roundtrip from the US to anywhere in the world in economy on American Airlines and its partners. South America is as little as 35k roundtrip, Europe 40k roundtrip, Asia 50k roundtrip, Africa and Australia 75k roundtrip, and the Middle East and India 90k roundtrip. For the full chart, see here. American has good partner availability to hard to reach places like Tahiti, the Maldives, Easter Island, Fiji, and more. 5) 75,000 miles is enough for two roundtrips from anywhere in the US to Hawaii. Applying for the Citi AA personal card. Applying for the Citi AA business card 24-36 hours later. Meeting the $3k minimum spending requirement per card. Once you have the cards, you can enjoy the 10% rebate on the miles needed for AAdvantage awards up to 10k miles per calendar year and other benefits like a free checked bag and priority boarding. Based on the information provided on another blogger’s website, on behalf of my wife’s sister who does not speak English I applied for Citi Platinum Select AA on Monday evening. The following day I applied for Citi Gold AA card. It was quite surprising to us that she was approved for both of them instantly! The only issue we had was Barclay’s US Airways card as there was no decision made yet. We’ll most likely call later today. Congrats. Was the bonus on the Citi Gold AA card 30k miles? I have just been speaking with Citibank about the AA offer. I called because I have an AA citibank card for 23 years. The offer says for new applicants only. I called to ask what they would do for loyal members. The applications desk said just apply for card and if you are approved and meet the spend, you will get the bonus miles. I asked about the inconsistency and if this meant I would not be approved if I already had a card. I think something was lost in the translation. Any suggestions as to how or whether I can take advantage (pun intended) of this offer? There are hundreds of reports across the web of people getting the bonus on the AA cards more than once. YMMV. If I were in your position, I would cancel my 23 year old card and apply for the new one. Most people have found that if you haven’t applied for a Citi card in 18 months, you can get approved for a new one as a new customer and get the bonus. This 23-year-old will play an important role in any CC application as it increases average length of the aplicant’s history. Thanks so much for you response but I now have an update: Citibank called me back (amazing service) and told me that since I had not applied for a new card in the last 18 months, I was eligible for the new offer (without canceling my old card). I am now approved for the Platinum 40,000 mile offer. By the way, if you go to citicards site, only a 30,000 offer appears; if you go to citi.com, the 40,000 offer will come up under the heading limited time offer. So you got the same offer as the one in this post. Nice! Would you believe that I was just approved for CitiBusiness AA Visa card?! Maybe it would not be surprising to anyone if not the fact that the date of my application is 2013-03-08 ….. so it took them two months to send me 3 ‘4506-T’ forms: one for 2011 and TWICE for 2012! Finally, after speaking to a supervisor over the phone (apparently the lower lever customer service rep kept only repeating ‘we requested 4506 form’) I was approved for this card, i.e. spend $3K in 3 months and you’ll get 50K miles. What if I already have a Citi AA Visa, Amex, MC, and business MC? I got these a few years ago. Can I apply again now and receive these current bonuses? Will they consider new applications for what would effectively be duplicates of cards I already hold? Thanks. If you cancel the cards and apply again, you will be considered a new customer (for bonus purposes) if your last application for the cards was at least two years ago (and maybe if it was 18 months ago) according to people’s experiences they’ve shared with me. Do you have to have an actual tax ID to apply with Citi? Thought they were way tougher than Chase and Amex. So you just used your SSN? Did they ask for proof of business? I didn’t get asked for any proof. I used my SSN and was instantly approved. I applied and was approved for both personal and business Citi AA Platinum cards on the same day about 3 weeks ago; others have reported the same and I have not yet seen anyone on the FT thread who has indicated that they were denied for 2 applications on the same day when one was personal and one was business. The 2 applications in one day rule seems to apply specifically to personal cards. This is slightly off topic but do you know if you can apply for a barclays personal and business card on the same day? I’ve been wondering about that too. And in fact, I’ve asked here – TWICE over the past few months – the first time, a couple months ago, got this response from MV “I’ll post about that next week” (there was no follow-up post on the subject the next week or since); the second time I asked I received no response at all. The question should not be if we can but rather if we’ll be approved for both:) I did it some 3 months ago and got declined for the business version. There’s no way to convince them about payinig credit card/s on time, low utikization of a credit, etc. etc. They just told me ‘you’ve already been approved for a personal card. You do not need another one. Start with one first’. I decided not to post about the topic for the moment. Sorry. I recently applied and was approved for a 50k mile AA Visa card from the FT link. Ever since, I have been getting offers in the mail for AA visa cards with 40k bonus for 1k spend in 3 months. What are the odds of me getting another one of the same card, even if it is pre-approved as per the mail offer? Any thoughts? Should I apply? I think you’ll be rejected because I haven’t seen reports of people getting two business cards within 18 months consistently. I’ve had both the AA Citi Visa and AMEX since February, but I’m wondering if I can still get the 40,000 mile bonus on this Mastercard offer. Thoughts? Using this method of applying for 2 cards a little over 24 hours apart, am I getting one or two hard pulls on my credit report? I like to get some input from people who applied 2 cards. I was approved for the Citi AAdvantage PSMC after reading this post. Then I received 2 offers in the mail for the VISA version of the same card – one for 40, 000 the other for 50, 000 bonus. Why do you suppose I got these and should I apply?